Started about 2 weeks ago we're already on 119 members. While I'm not on Facebook I've been told there are about twenty Garry Kasparovs on there, some of whom may be other people with the same name, but most are or purport to be the chess player. Maybe none of them are the real GK. Correct me if I'm wrong but is this not a potential information gathering exercise, ie by pretending to be someone, they become your friend, and you get to see their homepage and can add their info to your database. There could be someone on there pretending to be me for all I know, and I would be entirely unaware of it. Personally I think the world has gone mad. Am I on my own here? "Personally I think the world has gone mad. Am I on my own here?" No - you're quite right. Exhibit A for the WHGM hypothesis? That would be the current rigorous airbrushing of history re: Michael Jackson ... although if you were on facebook (and my fb friend) you'd know I already I think that. 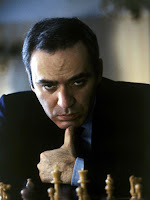 PG - quite possibly but I wonder whether in the circumstances, somebody as well-known as Mr Kasparov wouldn't find out about this and put a stop to it really quickly if it were true. I suppose some of his genuine real-life friends would say "oh I was looking at your Facebook entry the other day" and he'd say "you what? ".